In the midst of mainstream America's pitifully misguided campaign to eradicate all things French, along comes Cameron Mackintosh's irrepressible Les Misérables to remind us not only that were it not for the French we likely would still be part of the British Commonwealth, but that it is the French who still believe in the principles which were once the cornerstones of this republic: liberty, justice, and representative democracy. That said, after 16 fruitful years on Broadway, Les Misérables now lives on the road, with a short stop this week in Denver. Replicating the Broadway production in its entirety (34-foot turntable, massive barricades, countless costumes, full orchestra and cast), save for a 15-minute trim off its three-hour length, the current production running at the Buell remains just as powerful and relevant as its predecessors. 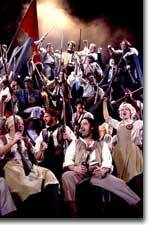 Ian Rutherford, who stars as Jean Valjean, as well as many of his fellow cast members, are veterans of the Broadway company, and the experience shows. Rutherford is commanding throughout, from his desperate days as a fugitive from state terrorism to his magnificent show-stopper, "Bring Him Home." He is matched every step of the way by Stephen Tewksbury, as his dogged nemesis, Javert, whose massive physical and vocal presence is both mesmerizing and intimidating. Tonya Dixon, as Fantine, delivers a saintly "I Dreamed a Dream," Jessica-Snow Wilson, as Eponine, brings the house down with "On My Own," while Scott Hunt, as Marius, and Amanda Huddleston, as Cosette, are poignant as the war-torn lovers. If you've never seen Victor Hugo's epic tale, or if you think freedom died with the Bush-Cheney junta's coup d'état, Patriot Act, and imperial wars for oil, find a ticket for this powerful production. Les Misérables runs through May 24th at the Buell Theatre. 303-893-4100.